This cabinet card captures the beauty of actress Kate Everleigh. The image is risque for the cabinet card era. Preliminary research reveals no personal details of the life of Miss Everleigh. However, there are many articles citing her theatrical appearances. In fact, her portrait appears on the front page of “The Illustrated Sporting and Dramatic News” in both 1885 and 1886 editions. She is also referenced in the book “A History of the New York Stage” (1903) for appearing in Reese and Farnie’s burlesque production of “Oxygen” and Lydia Thompson’s Company’s production of “Bluebird”. Everleigh also appeared in the original London cast of “Erminie” (1885). The magazine “The Theatre” (1885) cites her appearances in “Nemesis” and “Family Ties”. Miss Everleigh also performed in the United States. She is mentioned as a performer in a burlesque show in San Francisco called “The Mother, The Maiden, and The Musicianer” (1880). This is a high quality photograph and not surprisingly, comes from a well respected studio in Boston, Massachusetts. The studio is Warren’s Portraits and it was located at 465 Washington Street. The photographer was George K. Warren. Warren’s Studios photographed many celebrities and notable people in Boston. To view other photographs by Warren, click on the category “Photographer: Warren”. A pretty young woman, named Annie L’Etille, poses for her portrait at famed Boston portrait photographer Warren’s studio (465 Washington Street). The photographer was George K Warren. Judging by the size of the cross that she is wearing around her neck; she appears to be making a religious statement. The reverse of the card has a notation that indicates that Annie later became Annie L’Etille Peamate (possibly Peamite). The photograph is dated 1878. To view other photographs by the Warren’s studio, click on category “Photographer: Warren”. 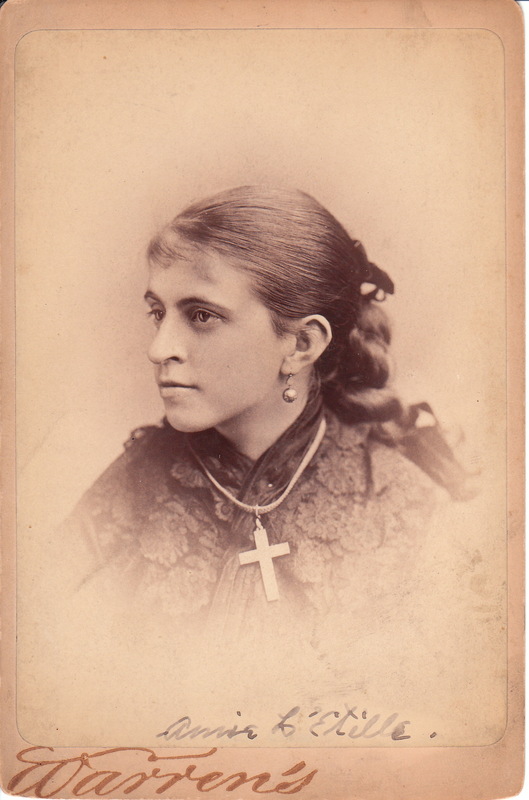 This cabinet card is an image of actress Annie Edmondson (1871-1923). She was married to Shakespeare actor Frederick Warde. The photographic studio is famed Boston portrait artist Warren’s Portraits and the photographer was George K. Warren. To view other images by this photographer, click on the category “Photographer: Warren (George K.).